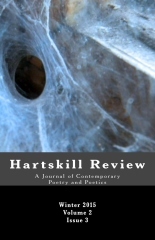 Volume 2, Issue 3 of the literary journal Hartskill Review is available for purchase. Hartskill Review is dedicated to publishing contemporary poetry crafted with thoughtfulness and care. It also contains reviews of poetry collections and chapbooks. Among the works included in this issue are my poems “Craigslist” and “Entry from an Insomniac’s Dream Book.” I really appreciate the chance to contribute. Thanks to editor Joshua Hjalmer Lind for deeming my work worthy of publication.